Put those two things together and you have an avid reader that recognizes weapon errors in fiction. If it were just firearms instructors that notice these mistakes, I wouldn’t worry too much about them. However, with between 270 to 310 million firearms in the United States* it’s a good bet that simple errors could distract many of your readers. Here are ten of the most common firearms mistakes that I’ve encountered, and some advice/tips on how to avoid them. While the term clip may seem interchangeable with the term magazine, they are completely different items. All modern pistols use this system. 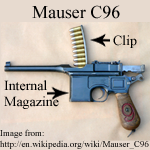 In fact, the only pistol reloaded by a clip, that I’m aware of, is the Mauser C96. The C96 is one of the classic handguns German officers brandish in WWII movies — not exactly a common handgun on today’s streets. So, use “magazine” or the slang/lingo “mag,” when referring to loading and reloading handguns. When a semi-automatic handgun is fired until its empty, the slide locks to the rear and the trigger is disengaged. The trigger can’t go “click.” Semi-automatic pistols only go click when the trigger is pulled, the slide is forward, and either the chamber is empty or there is a bad round in the chamber. A revolver can go click when it is empty because the cylinder will continue to rotate when the trigger is pulled. (Note: double action revolvers only.) 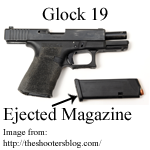 In place of “clicking on empty,” describe how the slide has locked to the rear on an empty magazine. Whether your character is using a shotgun or a pistol, if they rack the weapon before shooting another character, they have been menacing with an unloaded weapon. Racking the slide of a pistol or the pump of a shotgun can be very dramatic, but only in the right context. Ensure that your “expert” operator operates his/her firearm like an expert. See: Racking the Slide below. As with item number 3, there are a number of pistols without hammers. These guns can’t be “cocked” by your character for that moment of drama. Make sure that you know the anatomy, features and functions of the firearms in your story. Much has been made of “stopping power” when referring to caliber, bullet weight, or type of bullet (such as hollow points). What stopping power actually refers to is the amount of damage done to a person. It is the damage that makes them “stop” what they are doing. Even though a bullet can deliver a massive amount of energy to a target, it doesn’t mean it can move that target. Bullets enter, and in many cases pass through the body — the classic movie trope of a bad guy flying backward after being shot by a high-caliber weapon does not happen in real life. The average 9mm round weighs in at a hefty quarter of an ounce. Stacked up against a 150-pound human, human mass wins. Even the venerable .00 buckshot round or 12 gauge shotgun slug will not throw back a shooting victim. When describing the effects of bullet strikes, stick to wound effects and internal ballistics: let Hollywood have victim acrobatics. If your character is involved in “The Shootout of the Armageddon,” make sure that they take time to reload every once in a while. A gun going empty at a critical time is a great drama builder, but it is dictated by the capacity of the weapon. If the weapon has a 15 round magazine you are permitted 16 shots (if your character is knowledgeable enough to load one in the chamber and also have a full magazine, a process called “topping off,” see the glossary, below). And if you do top off? Make sure the reader is shown that before the battle begins. The media that you’ve watched all your life influences how you describe your character’s is positions, actions, and how they handle their weapons. Make military and police contacts and ask if you can observe training. The way true professionals handle their weapons, move, and use cover is completely different in reality. 2. Talk to an expert. Ask a Law Enforcement Officer how they carry and handle weapons. Techniques will vary greatly across different agencies, but this is a step up from a gun dealer of dubious experience.